Kate Middleton just arrived at the BAFTAs and she looks incredible! The Duchess of Cambridge donned a one-shoulder white gown for the occasion. See it here! Everyone at the BAFTAs, step aside; Kate Middleton has arrived! The 37-year-old duchess showed up at the Royal Albert Hall in London with her husband, Prince William, for the 2019 awards show and she couldn’t have looked more gorgeous. 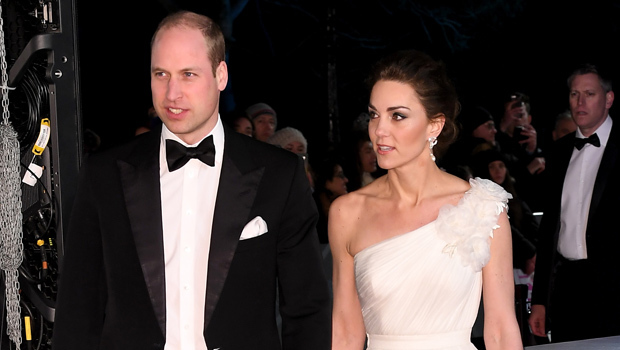 The Duchess of Cambridge looked stunning in an extravagant white gown. The dress also featured a ruffle design on the one-shoulder and was cinched in at the waist. Kate accessorized with silver drop earrings, a diamond bracelet and a white clutch. Her beauty look was just as on-point as the rest of her look. She styled her hair into a chic updo and looked radiant thanks to some blush, highlighter and a winged cat-eye. Kate’s husband, who is the president of the British Academy of Film and Television Arts, also looked handsome in a classic black tuxedo. Due to William’s BAFTAs role, he and his wife have been attending the awards show since 2017. Last year was an extra special appearance, however, because Kate was pregnant with their third child, Prince Louis! She was glowing in an olive empire waist gown by Jenny Packham for the event. She completed her look with an emerald and diamond necklace with matching earrings. While her 2018 ensemble was a surprise – she didn’t wear black like most other actresses in solidarity with the Time’s Up movement – she did follow her own tradition of wearing something by a British designer. Looks like she’s kept that trend up again this year! The BAFTA Awards will air at 9 p.m. ET on BBC America.